"Coega is by far the best SEZ in Africa and in the developing world." Coega is an internationally acclaimed and award winning organisation. It is the Number One SEZ in Africa in terms of investment promotion (and performance). It is among the Top 7 SEZ in the world (the only one in Africa) that has been earmarked by the World Bank and School of London as the successful model or case study for SEZ development. Coega has achieved phenomenal success than all the SEZ in South Africa combined to achieve 43 operational investors (45 by end of 2018); which are local & international investors in the SEZ including Discovery, WNS, Famous Brands, BAIC SA, FAW SA, to mention but a few), who have accumulatively invested in excess of R7.7 billion. Remarkably, over the past 8 years, Coega SEZ has achieved 77 new investment pledged estimated at R47.7 billion in various sectors of the economy, including automotive, energy, agro processing, and Business Process Outsourcing. 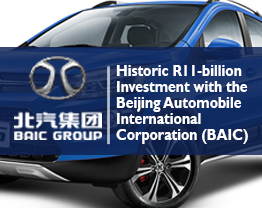 R12, 2 billion has already been realized and construction is currently underway for BAIC SA (R11 billion), Cemza (R600 million), MM Engineering (R350 million), Hella (R50 million), Akacia Medical (R100 million), and Agni Steels Expansion (R100 million). The Coega SEZ is ready to “plug and play”. All the necessary infrastructure is in place, including roads, bulk water and sewer networks, telecommunication sleeve networks, electrical substations (HV and MV), and overhead power lines (HV and MV) – all that investors are looking for and more in a world class industrial development zone. · There is a rail connection between the SEZ, the rest of South Africa and neighbouring countries. · Major roads provide a seamless link into the national N2 arterial highway, which connects the SEZ to the rest of the region. · The zone is integrated into Africa’s newest deep-water harbour, the Port of Ngqura. · National and international connectivity for passengers and freight is provided by the Port Elizabeth International Airport (PLZ), which is around 20 minutes travelling time away on the N2 Freeway. · It takes just 1 hour 40 minutes to fly from PLZ to OR Tambo International Airport on a route serviced by a number of airlines. · The distance to the main banking and business precincts in Port Elizabeth is around 20 km, which takes about 15 minutes. · The Coega SEZ is strategically positioned on the main Southern Hemisphere east-west shipping routes. · It is the only SEZ in Africa to be served by two ports, with a combined capacity of over two million TEU (Twenty Foot Equivalent Unit) a year. · The deep-water port of Ngqura is the designated South African hub for container traffic, and is served by the world’s top shipping lines. · Named day services connect the port to the main global markets and supply centres. · The Port of Port Elizabeth operates world class container, vehicle, breakbulk and bulk terminals. · The shipping links are complemented by direct road and rail links to the rest of South and Southern Africa. · Geographic Information System helps investors make informed decisions on positioning their plant. · ICT Solutions for supply chain management, budgeting, procurement and financial management. · Customs Control Areas (CCA) in the Logistics and Automotive Zones. · Customs compliance infrastructure management. · Proven in-house expertise in delivering infrastructure projects of all sizes on budget and on time. · Full Human Relations support, including recruitment, training and managing labour relations. · Assistance with visa applications, work and study permits, applications for municipal services. · Assistance with applying for incentives. · Facilitation of environmental approvals and licence requirements for project development (EIAs, Basic Assessment, Air Quality Licence, Waste Licence and OEMP). · Customs services to assist with all SARS Customs registrations and permit processes in preparation for approval of facility for operational phases. · Incentives: Assist all investors to ensure optimal use of all necessary incentives available to industry (SEZ, Municipal, and Sector Specific Incentives). · The CDC’s Package of Plans approach allows statutory approvals for Site Development Plans and Building Plans to take place within 10 working days, respectively. · Construction management and operational Safety, Health and Environment (SHE) management systems in place. · SHE systems monitor and control construction and operational phases (waste management, water and air quality, storm water and effluent, alien plant eradication, open space management). · The CDC clinic provides services during construction and operational phases. · The Coega SEZ also provides some of the most affordable rates for developed and zoned industrial land in Africa. · Systems are in place to assist investors with skills development. · Advanced systems for registering work-seeker and competency based recruitment functionality. · Advanced labour management systems in place. · Central wage payment services. · Construction Village facilities provide accommodation, conference and training venues. · Partnership with internationally recognised university (NMMU) for research and development. · Apprenticeship training centre (construction, manufacturing and MEI). · Nelson Mandela Bay and its surroundings offer a lifestyle that is the envy of other SEZ operators around the world. · It offers a cosmopolitan Indian Ocean lifestyle that is a unique mix of the best of African, European and Asian cultures. · Executives and key staff will find comfortable homes within a 20 minute commute of the SEZ. · Nelson Mandela Bay has world-class theatres, including an opera house, museums, restaurants, beaches, public gardens, sports stadiums, gymnasiums, hospitals and shopping malls. · It is home to some of South Africa’s top schools, as well as the Nelson Mandela Metropolitan University. · There is plenty of opportunity to enjoy the great outdoors – Nelson Mandela Bay is the sunniest metro complex in South Africa. · Algoa Bay, the metro, is rated as one of the top water sport venues in the world and has world-renowned Blue Flag beaches. · Nelson Mandela Bay is the gateway to the world-famous Garden Route. · For those venturing further afield, the Metro is 750 km from Cape Town along the Garden Route, 1 000 km from Durban, and 1 300 km from Gauteng.